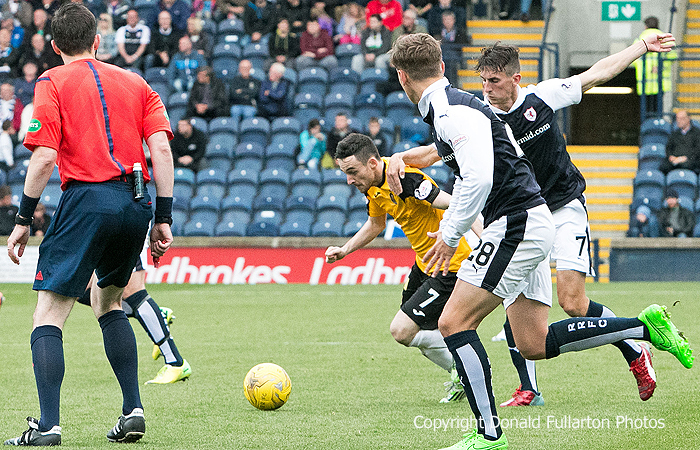 DUMBARTON once again drew a blank as they faced Raith Rovers at Starks Park, Kirkcaldy. DUMBARTON once again drew a blank as they lost 1-0 to Raith Rovers at Starks Park, Kirkcaldy, in front of a crowd of 1,440. They gave as good as they got it in terms of possession and attacking, but the midfield failed to find the passes which would unlock a stuffy home defence, leaving lone striker Eamonn Brophy feeding on scraps. They could easily have been ahead at half-time, but efforts from Brophy, Kevin Cawley and Scott Brown came to nothing. At the other end keeper Mark Brown had to be on his toes to keep out the home attackers. After the break Sons were more positive and chances fell to Cawley (twice) and Brophy, but the home keeper had little else to do. But at the other end no.5 Lewis Toshney earned three points and the man of the match tag when a free kick hit the bar and he headed home the rebound for the game's only goal. The arrival of sub strikers Stevie Ross and Donald McCallum freshened up the visitors attack, but it was just one of those days in front of goal. The picture shows Kevin Cawley being held back in front of the referee.